This Paper considers the issues and variables involved with stress on Hoses and Marine Breakaway Couplings when wound onto Hose Reels. 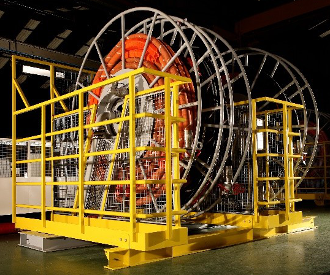 In recent years there has been a trend towards transfer operations adopting Hose Reels as a method for deploying, recovering and storing Hoses in offshore transfer operations. There are several benefits in using this method; including increased storage capacity, a neater and therefore safer working environment, reduced risk of random damage and fatigue on Hoses and more efficient Hose application during transfer operations. With the aid of connectors at each end, the Marine Breakaway Coupling is fitted within the Hose string and is designed to close off both the upstream and downstream flow of media and then separate when an event causes an Activation. There are typically two events that can provoke an Activation. The first is when the Hose is stressed beyond its safe envelop – usually due to the drift of a vessel beyond predetermined parameters. The second is due to a pressure surge. In either case, the Marine Breakaway Coupling will reduce the risk of spill, help protect assets from damage and limit the potential of injury to the workforce. Risk of extended downtime and extensive clean-up costs are also reduced. Marine Breakaway Couplings have been protecting Hose transfer operations for decades; including when Hoses tended to be wrapped or left on vessel deck rather than wound on a Hose Reel. When Hose Reels increasingly became part of Hose transfer operations, the Marine Breakaway Coupling simply wound on the Hose Reel as part of the Coil. This method is adequate; however, outstanding issues remained regarding Hose and Coupling stress and therefore greater risk of asset damage and increased depreciation of operational equipment. Marine Breakaway Couplings that are maintained within manufacturer recommendations do not present any particular issues within a Hose String. However, when wound to a Hose Reel, there is an unavoidable and distinct interruption in the otherwise natural radius of the Coil. This profile interruption or Coil Discrepancy presents resistant variables that cause stress on the Hose and on the Marine Breakaway Coupling. The consequence of this stress can be fatigue on both the Hoses and Marine Breakaway Coupling breakstuds. 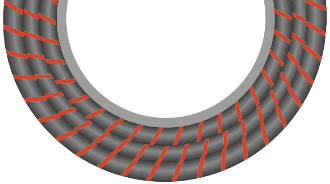 The level of Coil Discrepancy determines the Contact Angle of the Hose in relation to the inner wound Hose. Where there is no Marine Breakaway Coupling fitted to this section of Hose then the Coil Discrepancy is zero and the correct Contact Angle is maintained. Where a Marine Breakaway Coupling is fitted then a Coil Discrepancy will exist and the Contact Angle will be imperfect; there is then a value that is determined by the extent to which the Marine Breakaway Section of Hose is raised above the Inner Hose. The longer a Marine Breakaway Coupling is in length, the higher is this value and the greater are the stress points. This can be mitigated by the radius of the Hose Reel. A greater radius reduces Coil Discrepancy. A shorter Marine Breakaway Coupling may also reduce Coil Discrepancy and therefore reduce stress. 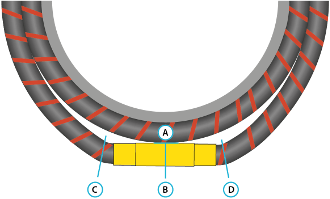 The following is an illustration of a Hose Reel where Coil Discrepancy is zero and the Contact angle is perfect. The following is an illustration of a Marine Breakaway Coupling fitted to a Hose Reel. A Coil Discrepancy will exist and the Contact Angle will be imperfect. Weight impact stress is caused by two variables. 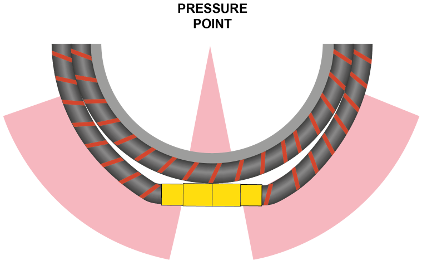 The first is the physical weight of the Marine Breakaway Coupling and its Profile Impact on the Inner Hose (Illustrated below as A). Weight may also vary depending on where on the Hose the Coupling is positioned during storage. The second is the additional displaced weight of the Hose on each side of the Coupling due to Imperfect Contact Angle. This will also provoke a Bending Moment and this in turn will add stress to the Coupling Breakstuds (Illustrated above as B). Given that the design of a KLAW Marine Breakaway Coupling is designed to resist Bending Moments and only respond to axial forces then Activation is unlikely. There is nevertheless the issue that frequent stress and therefore fatigue placed on the Breakstuds due to the repeated drawing of the Hose on the Reel will require additional maintenance attention. Hose Kink stress is caused by the extent of Imperfect Contact Angle. There is high correlation between the total space between the section of Hose fitted with the Marine Breakaway Coupling and the Inner Hose and the risk of Hose fatigue (Illustrated above in two places as C). All of the above stress factors can be magnified by any applied Hose tension when recovered back onto the Reel, and by additional Hose coils wound over the Breakaway Coupling, which may occur in some configurations. The KLAW Marine2 Breakaway Coupling was developed in part to address stress related issues on Hose Reels. The KLAW Marine Mark 1 Breakaway Coupling for offshore applications had been in operation for many years and was already the lightest and shortest on the market. This is due in no small part to the characteristics of the Flip-Flap Valve which are not available with alternative valve designs such as the Poppet Valve. The Marine2 Breakaway Coupling is 15% lighter and 10% shorter than the KLAW Marine Mark 1. This saving in weight and length provides exponential stress reduction benefits to Hose Reel applications and in consequence greatly reduces fatigue on Inner Hose and Outer Hose sections and on Marine Breakaway Coupling Breakstuds. 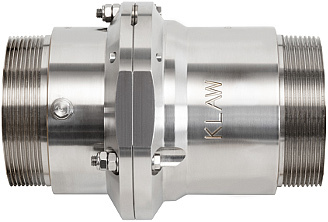 The addition of the unique Easy Reset Facility now fitted as standard to all KLAW Breakaway Couplings delivers the ability to service and reset the Coupling without the need to detach the Coupling from the line. This is an additional development that reduces fatigue on the Hose due to the additional handling and interference when detaching and reattaching the Coupling. Precise measurement of the proposed reduction in stress and fatigue on the Hose and Breakstuds is difficult due to the number of variables specific to any operation. 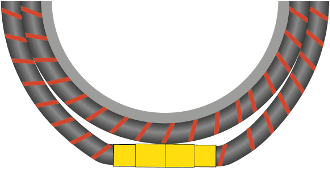 Examples include the type, quality and age of Hose, frequency of use, diameter of Hose Reel, Hose and Marine Breakaway Coupling size, ambient storage and operation conditions such as temperature and even the particular handling, maintenance and storage techniques employed by the operator. 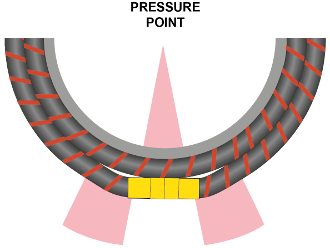 Nevertheless, a correlation between length and weight of Coupling and stress on the Hose and Breakstuds when wound on the Hose Reel has been shown and therefore a reduction in these variables will reduce fatigue. Profile Impact is higher in correlation to a greater Imperfect Contact Angle due to there being less support for the Hose other than the point where the Marine Breakaway Coupling is in contact with the Inner hose. Profile Impact can also be greater where Outer Hose is wound over the section of Hose fitted with the Marine Breakaway Coupling. The above illustrates an extended Imperfect Angle as caused by a longer Coupling such as that using a Poppet Valve. The above illustrates a significantly shorter Imperfect Angle as that achieved with the KLAW Marine2. Reduced Imperfect Contact Angle results in a lower Bending Moment being applied to the Marine Breakaway Coupling.